(Phys.org)—An international team of researchers has conducted a new test of Neanderthal remains found at Vindija Cave in Croatia and found them to be older than previous studies indicated. In their paper published in the Proceedings of the National Academy of Sciences, the team describes their dating technique and the possible implications of their findings. The Neanderthal remains were originally found in the cave approximately 40 years ago and have been tested for age several times. They have also been the subject of much speculation, as it was thought that the remains represented the last of the Neanderthals in that part of Europe and that they existed for a short period of time in close proximity to modern humans. Initial testing suggested the remains were approximately 28,000 to 29,000 years old. More recent tests have put them at 32,000 to 34,000 years old. Both time frames coincide with the arrival of modern humans into the area, keeping alive the theory that the two groups mixed, both physically and socially. But now, using what is being described as a more accurate technique, the group with this new effort has found that the remains are older than thought. The new technique, called ZooMS involves radiocarbon dating hydroxyproline—an amino acid taken from collagen samples found in bone remains. The team also purified the collagen to remove contaminants. The researchers report that the new technique indicates that the remains—all four samples—were approximately 40,000 years old. This new finding puts the Neanderthal in the cave well before the arrival of modern humans, thus, there could not have been mixing of the two. 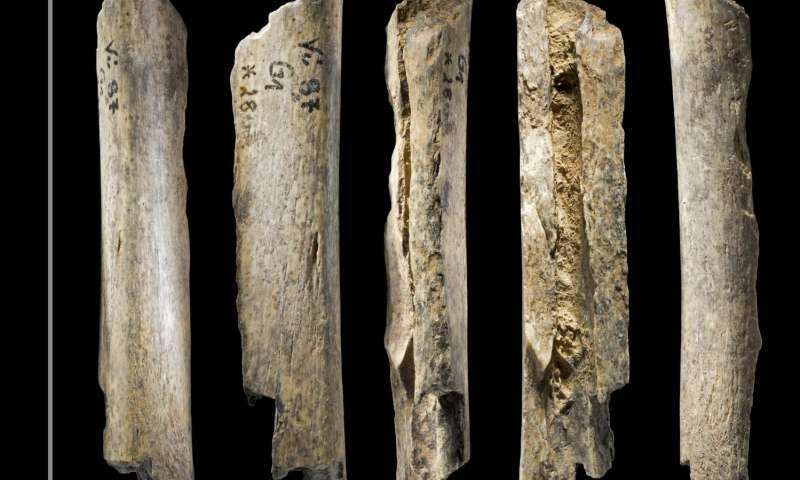 The researchers also studied other artifacts from the cave, including other animal bones, and found that the artifacts were a mixed bag, representing a timeline of thousands of years. The animal bones, they found, were from bears. This has led the team to conclude that the reason more modern artifacts were found with older artifacts is because of bears mixing them up. 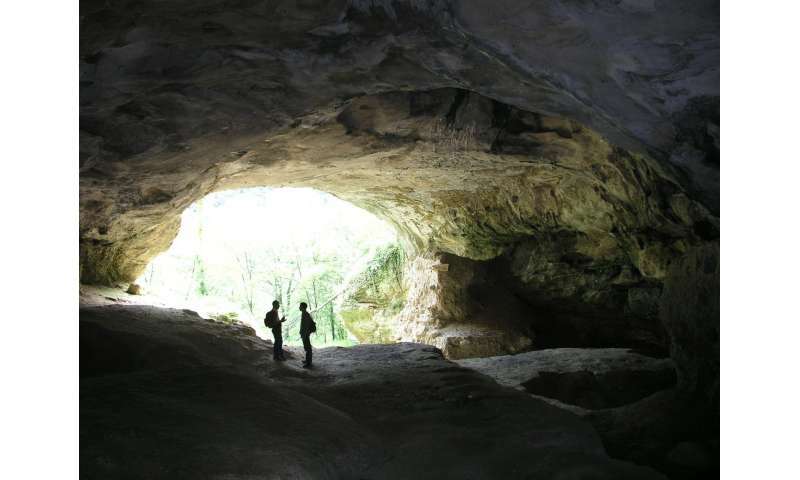 The researchers conclude by claiming their study has shown that the Neanderthals at the Vindija cave did not overlap in time with modern humans, and thus were not the final holdout that many have suggested. Previous dating of the Vi-207 and Vi-208 Neanderthal remains from Vindija Cave (Croatia) led to the suggestion that Neanderthals survived there as recently as 28,000–29,000 B.P. Subsequent dating yielded older dates, interpreted as ages of at least ∼32,500 B.P. We have redated these same specimens using an approach based on the extraction of the amino acid hydroxyproline, using preparative highperformance liquid chromatography (Prep-HPLC). This method is more efficient in eliminating modern contamination in the bone collagen. The revised dates are older than 40,000 B.P., suggesting the Vindija Neanderthals did not live more recently than others across Europe, and probably predate the arrival of anatomically modern humans in Eastern Europe. We applied zooarchaeology by mass spectrometry (ZooMS) to find additional hominin remains. We identified one bone that is Neanderthal, based on its mitochondrial DNA, and dated it directly to 46,200 ± 1,500 B.P. We also attempted to date six early Upper Paleolithic bone points from stratigraphic units G1, Fd/d+G1 and Fd/d, Fd. One bone artifact gave a date of 29,500 ± 400 B.P., while the remainder yielded no collagen. We additionally dated animal bone samples from units G1 and G1–G3. These dates suggest a co-occurrence of early Upper Paleolithic osseous artifacts, particularly split-based points, alongside the remains of Neanderthals is a result of postdepositional mixing, rather than an association between the two groups, although more work is required to show this definitively. No matter what they claim, we moderns are part neanderthal, and ever so often a throwback appears. We have one such knuckle dragger as da Prez.